William Penn founded the city in 1682 to be the main port city for the new Pennsylvania colony. By 1750 it was the largest city in N. America and the busiest port in the American colonies as well as the second biggest city in the entire British Empire (London was the biggest). 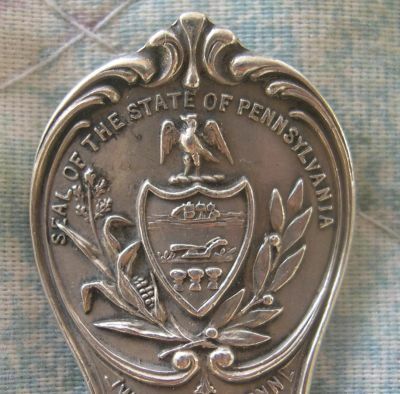 Before, during and after the American war for Independence, Philadelphia played a key role. and the signing of the U.S. Constitution (1787). In addition the city was the temporary capital of the USA while Washington D.C. was under construction. 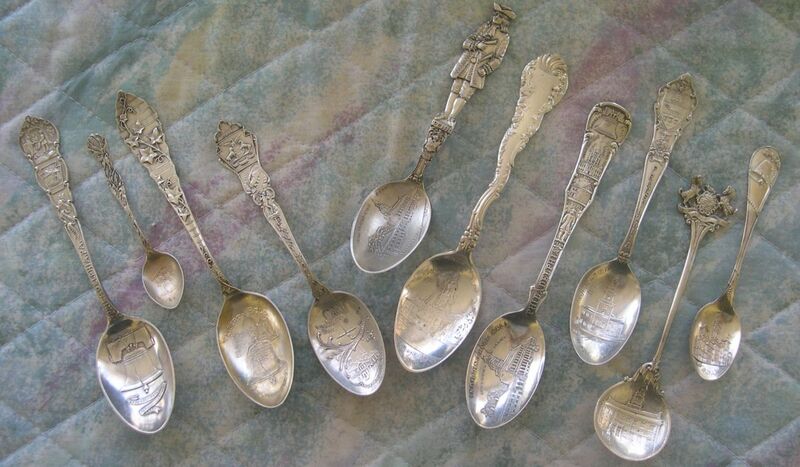 all spoons shown are sterling. 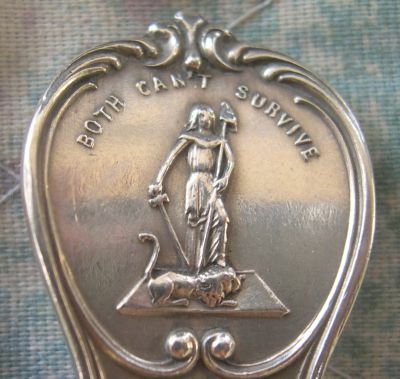 During the era of souvenir spoon collecting, two key aspects of the city were predominately shown. 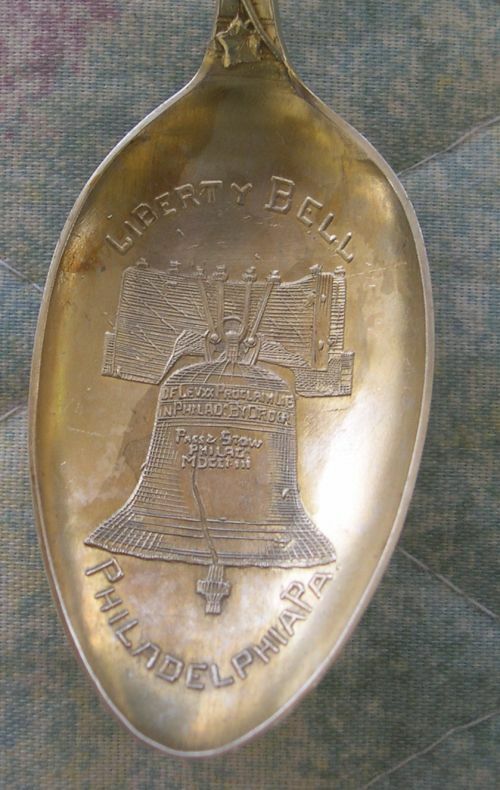 ""Proclaim liberty throughout the land unto all the inhabitants thereof"
The bell is a major symbol of American independence and formerly resided in the steeple of the Pennsylvania State House (Independence Hall). It was recast by John Pass and John Stow whose names appear on it. The bell primarily became a tourist attaction in the 1830's when abolitionists renamed it the "Liberty Bell". The bell cracked again when it was rung at the death of Chief Justice John Marshall in 1835. 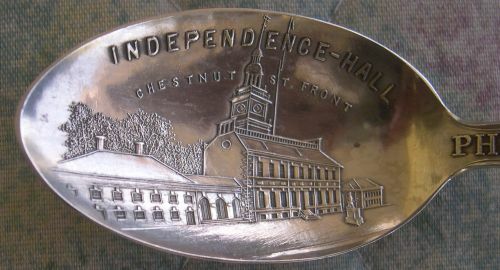 Completed in 1753, Independence hall at Chestnut St.and 5th St was used as a colonial legislature for Pennsylvania. Both the Declaration of Independence and the U.S. Constitution were debated and adopted in this building.